Radio Free Asia reports that Chinese human rights activist Ma Yongtao, who led several public protests against China in Europe, was about to be forcibly repatriated from the Netherlands to China, after his request for political asylum was denied. The deportation was stopped at the last minute thanks to the intervention of Dutch and international human rights organizations. Radio Free Asia believes that, in the case of Ma Yongtao, systematic pressure from China led to the refusal of political asylum. 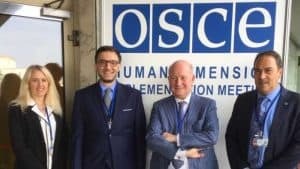 On the other hand, that deportation was prevented at the last minute also confirms that the intervention of non-governmental organizations is often effective and gives hope for similar cases. Bitter Winter reported this week on the situation of Sister Zou Demei, a regional leader of Chinese Christian new religious movement, The Church of Almighty God, who faces deportation to China from the United States. Ten leading human rights and religious liberty organizations have asked President Trump to intervene in preventing Sister Zou from deportation. The legal situation of Ma Yongtao in the Netherlands remains unclear. 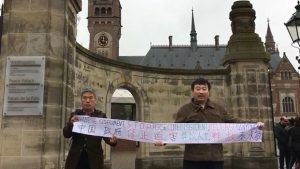 Photo: Chinese human rights activist Ma Yongtao (R) holds a demonstration at the International Court of Justice in the Netherlands city of The Hague. Courtesy of Liu Xinglian.